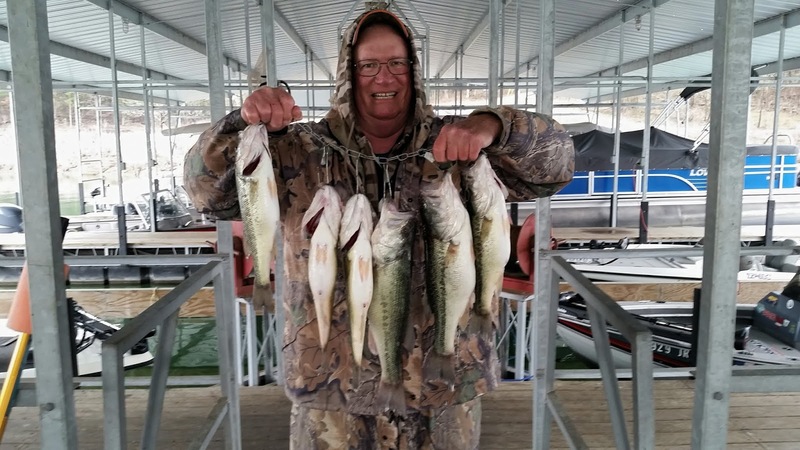 Spring is here on Norfork Lake. Trees and flowers are blooming and the fish are active. Crappie are very close to their spawn and I believe a few have already started. The bass are staging for their spawn. Surface water temperature is in the low 60's in the early mornings and rises during the warm days. Water level has been fairly stable. 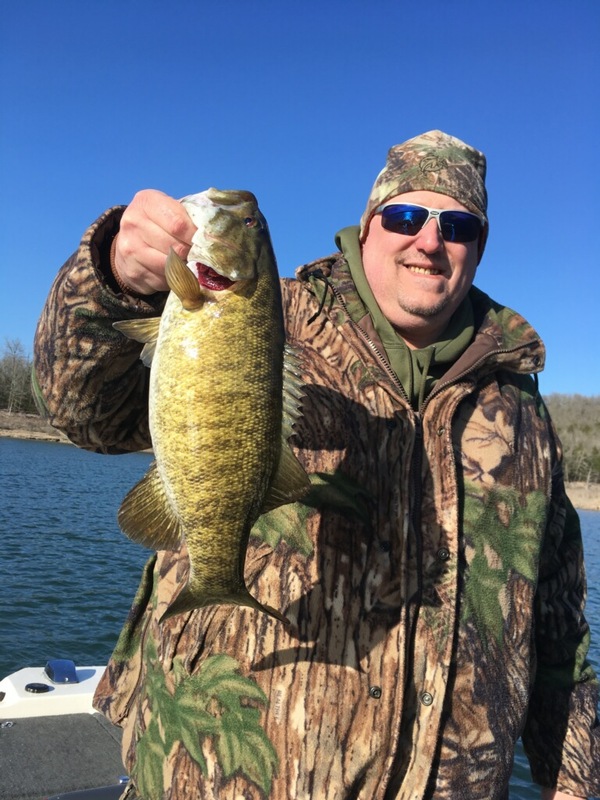 Everything is perfect for a great spring fishing season. Oh yeah, topwater action is starting and will only get better. 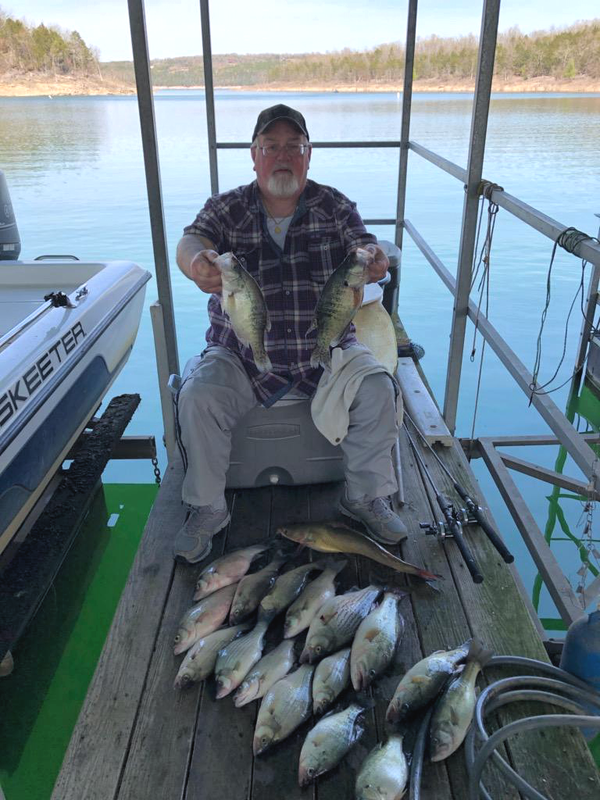 The crappie bite has been very good over the last week. Guests are catching nice slabs on the banks by casting out 1/16 to 1/8 ounce Roadrunners. Some other guests and I have been slow trolling Flicker Minnows in 15 - 25 feet of water. 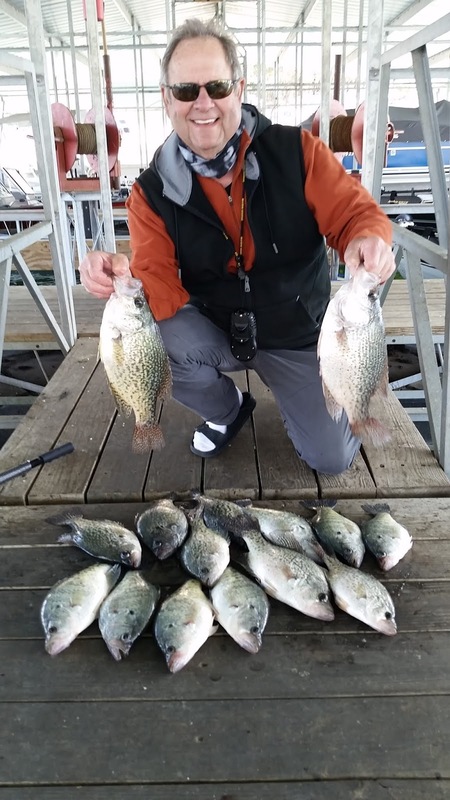 Large schools of crappie are either on brush or roaming in between brush piles. This morning I fished in a couple of small creeks. 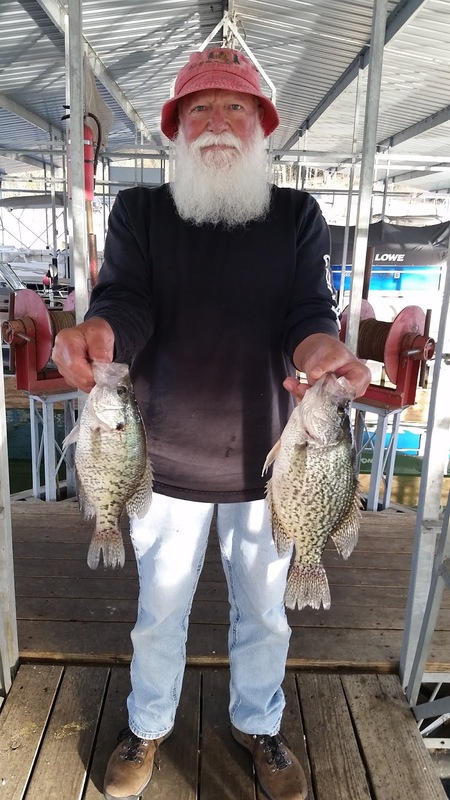 The crappie were very active until around 9:30AM. 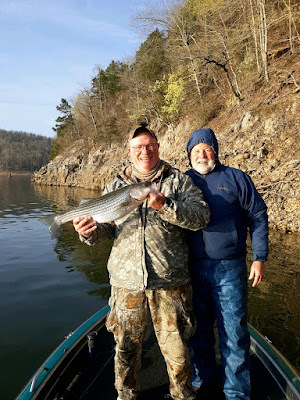 I was trolling a #7 firetiger and pearl silver colored Flicker Minnow. When one of the 15 inch slabs hammered the bait I thought I had hooked up to a hybrid, it was fighting so hard. It was great fun. I released all fish. The best location to look for crappie is back in coves and creeks. 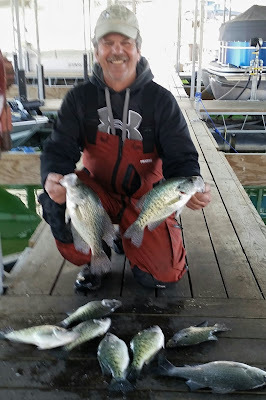 When I trolled over brush piles I could see the crappie just sacked in the brush. If a tree was lying down the crappie seemed to be on the trunk side and other fish were roaming away from the brush. Largemouth and spotted bass fishing has also been good. 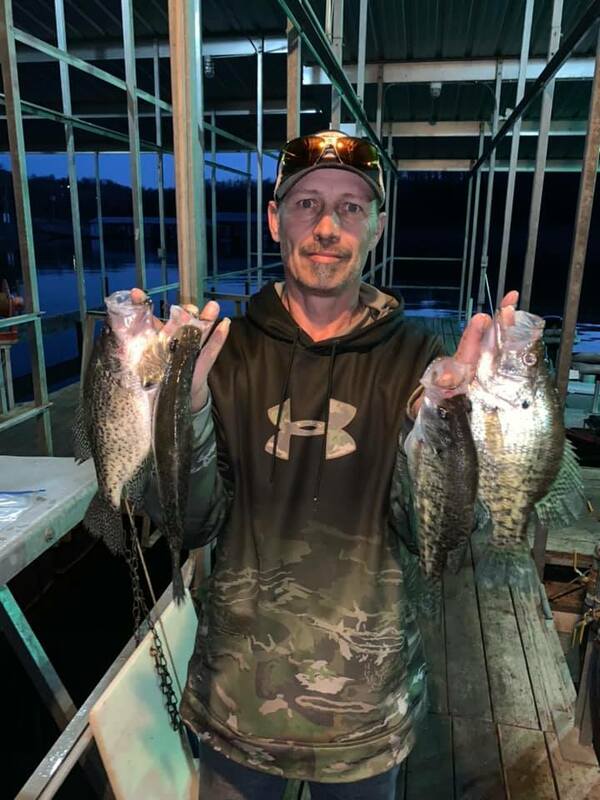 The best bite appears to be at sunrise and sunset with topwater action occurring during both of these times. I have been finding most of my fish back in creeks and coves along the shallow shoreline. I have also found them way in the back of these creeks in 6 feet or less of water and several times this was the area for the best topwater action. 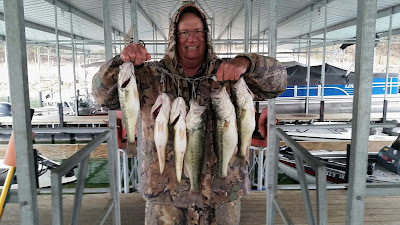 Alabama rigs, crank baits and jerk baits have been the better choices of bait so far for me and some of my guests. Plastics are starting to work, especially the jerk baits such as Flukes and Bass Assassins with a weighted hook. The largemouth are staging for their spawn, which will start to happen at any time. 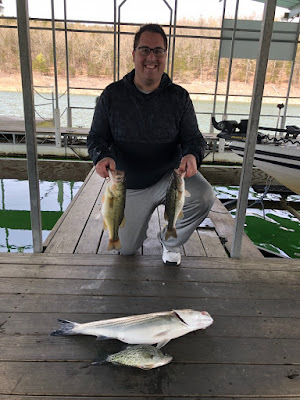 The striped and hybrid bass bite is slowly improving. They have not moved into my normal early spring time areas, but have been hanging out back in the creeks and some of the larger coves. Once you find the bait this species will be near by. The afternoon bite still seems to be a better time to find and catch fish. Topwater action has occurred with hybrids and stripers blowing up on shad in the mornings and evenings, but the locations have not been consistent. It takes some time searching with your electronics, but when you find them the excitement begins. 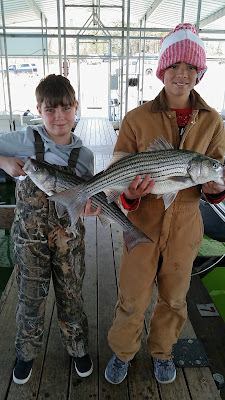 Trolling for striped bass with an umbrella rig still seems to be a very good way to catch this species. You get to cover a lot of ground when you are trolling and will end up hooking up with some nice fish. Early in the morning throw a fluke or a jerk bait to the bank once you know bait is in the area and you will find some feeding fish. In the late evening and after dark. Slow rolling a stick bait, such as, a Smithwick Rogue has produced some nice fish for me over the last couple of weeks. This we call the night bite. The striped bass are coming into very shallow water on points to feed. This species will continue to feed after dark along the shoreline for the next month or until the bait starts to move to cooler water. Norfork Lake level is holding fairly stable with a slight increase due to a rain yesterday morning. The current level is 554.77 MSL. The lake surface water temperature early this morning was 62 degrees but will rise during the heat of the day. The lake is getting really clear. I cannot say crystal clear, but if all stays stable it will continue in that direction. I can actually see bass on the shoreline starting to look around for a good nesting area.